Bowser's body is a location from Mario & Luigi: Bowser's Inside Story and its remake. After Bowser, under the influence of the Vacuum Shroom, inhales everyone at Princess Peach's meeting, Mario and Luigi must search for the missing princess within his body. 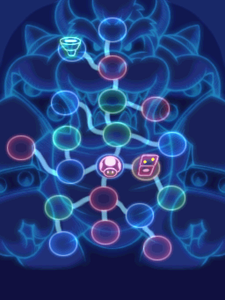 On the map of Bowser's body, the big areas with many enemies are denoted with green circles, places where minigames are played are red circles, places where moves are unlocked are blue circles, and finally the only other place, the challenge node, is yellow. Trash Pit - Bowser's large intestine. Mario, Luigi, and Starlow start their journey here after Bowser inhales them. Funny Bone - A sensitive area in the liver that, when attacked, causes Bowser to awaken from unconsciousness. Toad Square - An area where the Toads, who have also been inhaled by Bowser, amass all the junk they have found and set up shop. Challenge Node - An area in Bowser's spleen where Mario and Luigi can participate in the optional events, the Gauntlet, Cholesteroad, and test their jumping skills on the 99 Block. Arm Center - The locations of Bowser's arm muscles. From here, the Mario bros. can increase Bowser's strength by stimulating his arm muscles. Pump Works - An area in Bowser's esophagus that fills with water when Bowser drinks from a fountain. Toadsworth is rescued here. Flame Pipe - A passageway in Bowser's chest responsible for his ability to breathe fire. A Scutlet temporally blocks this passage, disabling his fire breath. Gut Check - Bowser's stomach. Here, the Mario bros. help Bowser digest a large carrot. Nerve Cluster - An extremely sensitive area in Bowser's elbow nerves. When Durmite's presence invokes great pain, the Mario bros. track her down and defeat her. Rump Command - In Bowser's tail. Whenever Bowser is crushed by a large object, the Mario bros. must come here to give Bowser an adrenaline boost to revive and cause him to temporarily grow to the size of a giant. Flab Zone - An area in Bowser's hip skin that swells whenever Bowser indulges himself with fatty food. Princess Peach and Alpha Kretin are found here. Leg Outpost - In Bowser's pelvis and the surrounding muscles. Stimulating the thigh muscles here helps Bowser push large objects. Nose Deck - Inside Bowser's nose. Whenever Bowser inhales pollen, the Mario bros. can help provoke a sneeze. Energy Hold - A maze in the Small Intestine loaded with special cells that are manipulated to appear, disappear, or even move via radiation from the Boo-ray Machine. Durmite (who is really Wisdurm) is followed here. Joint Tower - An area where Bowser's leg and hip form a joint. The body slam move is unlocked here. Memory Banks - Bowser's brain. All of Bowser's memories are stored here and guarded by Bowser Memory Neuron. Lumbar Nook - Bowser's lower back. The spike ball is learned after the Mario bros. heal Bowser's back pain. Chest Station - Contains tendons that, when stretched and released, spring Bowser's body in various directions. Airway - Bowser's trachea and lungs. The area freezes whenever Bowser inhales cold air. The Dark Star is fought here after it leeches some of Bowser's DNA. Pipe Yard - In Bowser's head, where there exist pipes for transportation in and out of Bowser's body to the Toad Town Caves, Toad Town, Blubble Lake, Bowser Castle, Peach's Castle and Dimble Wood. This page was last edited on March 20, 2019, at 15:27.